Pour yourself a vodka cranberry, kick off your six-inch heels and pull up a seat: Untucked Season 10 is here! 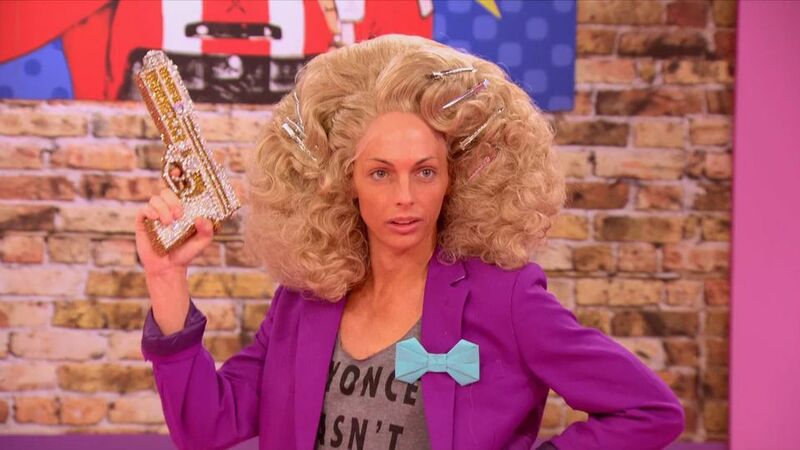 For the first time, Untucked is airing on Vh1 immediately after the main show. I’ll admit, it feels like it’s lost a little bit of its edge and distinctiveness—you used to have to find it on YouTube the next day!—but it means more people will be seeing it, which is a good thing. Still not convinced you need to be watching the backstage drama? Well, Season 9 of Untucked brought us the moment that single-handedly justified bringing Aja back as an All Star. Not to mention, the Untucked where Valentina went home pointedly shows us ALL THE OTHER GIRLS LEARNING THE LIP SYNC SONG. The Untucked editors are as shady as the queens! Now for this episode. The safe queens head backstage first, relieved to have made it through the first elimination, but Monét X Change seems to think her look deserved better. “I like my outfit! Y’all like my outfit?” she asks, to a resounding “NO!” from the others. She explains her full concept—the water earrings, the dirty face, the soap suds—to riotous laughter. I’m not sure I would have picked up on all that without her explanation, but I do appreciate the commitment to the gimmick, and Monét takes her dragging from the other queens in stride. She’s one of my early favorites. The Aquaria/Cracker rivalry is clearly going to be a big part of this season’s drama, and is brought up quickly while Cracker is still on stage. Aquaria says she thinks there will inevitably be a confrontation about it this season. (DUH!) Based on one anecdote about Cracker wearing a vinyl yellow dress with a cutout a couple weeks after Aquaria wore a vinyl yellow dress with a cutout, The Vixen is ready to throw down for Aquaria: “She faked it all the way to RuPaul’s Drag Race!” Monét defends Cracker’s career and calls The Vixen’s accusation unfair, and then The Vixen starts yelling that it’s not her fault everyone else made her jump to that conclusion. “Don’t make me out to be the villain before I’m ready to be the villain,” she says, revealing she has a keen self-awareness alongside poor impulse control. Eureka is an early frontrunner for Miss Congeniality. “It’s OK to have feelings!” she tells a happy-crying Mayhem, channeling my therapist (or every therapist?) She also gives about-to-be-eliminated Vanessa a Coach Taylor-worthy pep talk before the lip sync, equal parts “you’re a winner no matter what” and “go out there and do the damn thing!” We also learn that Eureka’s mom—who is actually named Eureka!—was recently diagnosed with throat cancer which is very sad. Before the lip sync and elimination, guest judge Christina Aguilera heads back to meet the queens. They are very excited! They ask her when she’s coming out with new music (soon!) and what advice she has from them (very vague stuff like, “Remember who you are as a person” and “Nothing can stop you!”) She also reveals that her ex who inspired “Infatuation” turned out to be gay, but confusing editing/pure confusion on my part makes it sound like she’s talking about “Fighter.” Whatever. For what it’s worth, the bonus clip of the real Farrah Moan meeting Christina is pretty sweet. Vanessa is eliminated and is understandably bummed as she packs up her stuff. She reads a couple of lovely notes left at her work station by her fellow contestants. I’m sorry we didn’t get to see more of her, but this season’s competition is fierce and it seems like the right call. I hope there are at least a couple of Pit Crew hotties helping her schlep to the airport in that van!